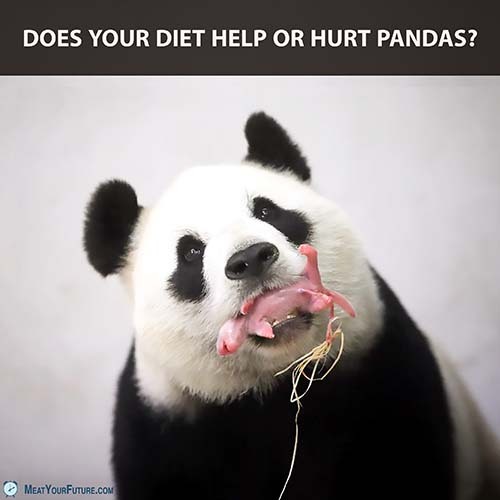 Does Your Diet Help or Hurt Pandas? The Answer May Surprise You. Does Your Diet Help or Hurt Pandas? Giant pandas are listed as “vulnerable” to extinction, as their bamboo habitats are being destroyed at an alarming rate. Did you know, according to the United Nations, that the *number one* cause of deforestation in the world is animal agriculture, and that animal agriculture is also the largest anthropogenic user of land on the planet? Animal agriculture uses so much land and is driving so much deforestation and habitat loss in response to *our demand* for animal foods, like meat and dairy. The good news is that you can withdraw your demand for animal foods immediately, simply by going vegan. We don’t need any animal foods to thrive (and, in fact, can be far healthier avoiding them altogether), and we would also be able to far more effectively feed our growing human population using far less land and fewer resources by growing plant foods for direct human consumption instead. It also withdraws your participation from the violent slaughter and immense harm inflicted upon countless billions of marine species and domesticated land animals. Please go vegan, not just for pandas, but also for the millions of other species with whom we share the world. What Happens When Pollinators Go Extinct?